I want to talk about a steam engne concept, that is, I assume, very out-of-the-box. The development of the steam engines during the time, when turbines and IC engines were about to take over as the prime marine propulsion methods, always caught my interest. Especially the uniflow principle, that created a design heavily resembling 2-stroke engines. From that time, I found some very interesting designs of steam engines adapting a design now usually associated with car engines. Single action pistons with cross-head-less crankshafts running in an oil sump and cam-shaft-actuated poppet valves mae it possible to have fast-running steam engines. There are a lot of youtube videos of IC engines being converted into steam engines by crafty folks and the idea to use existing and cheaply available IC engine parts really caught my interest. At the end, I was thinking and designing around a lot with poppet valves and I found an issue, that hasn't been adressed by the steam engine conversions on youtube (although there is an amazing site called "Kimmelsteam", that has a lot of car and boat engines, that were converted to steam in an amazingly professional way, with lots of ways to address the steam distribution. It is a very interesting site. other valves whatsoever. I foresee one challenge though: The crankshafts need to be coupled by gears of some type and the only way to alter the power output of an engine would be to change the rotational angular alignment of the crankshafts to each other by means of this gear. Technically it is very simple to do, for example via a chain gear. But the point is, that despite the relatively small amount of power used to work the "normal" steam valve gears, this design has to handle the full power of the engine going through the gear. So, the mechanism needs to be very sturdy. I was thinking of a governor, but I don't know it the governor used in this special occasion would swallow too much energy, since it works against all the engine's power. Please let me know if you know of any governor design, that can do the trick. But for a boat engine, that can run under very constant conditions (in comparison to a car engine) I think a manual mechanism could work fine. Last edited by Ramón on Wed Mar 06, 2019 12:55 pm, edited 2 times in total. 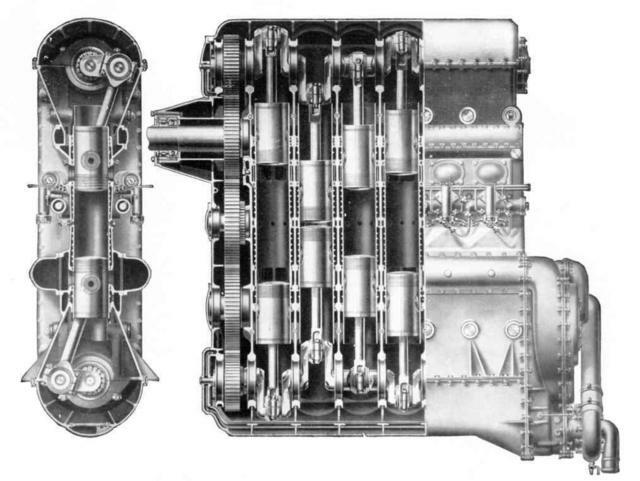 Interestingly, the use of the opposed piston design is like stepping on land where no man has gone before. At least it feels like that. As already for the more common steam engine designs, there had been written lots of amounts about the gears and how to calculate them. But this is new territory. So, I have to create all the formulas from scrap. The power calculation is not that difficult, but some deeply trigonometrical algebra is neccessary to calculate the inlet and exhaust timing. The positions of the pistons in relation to the angle of the crank need to be expressed with 2 sinus curves and those functions need to be solved to calculate the timing. The two pistons travel up and down inside the cylinder, creating approximate sinus curves. There are 3 graphs. The highest defines the movement of the upper piston and the two lower show two cases for the lower piston movement. The Y-axis is to be read in centimeters. The crankshafts have an approximate stroke of 3cm, so the amplitude of all graphs are the same. If the crankshafts are geared together to produce the middle graph, the lower piston roughly reaches the inlet port while remaining as close to the upper piston as possible before it reaches TDC (even this can not be achieved satisfactorily). But even before the intake ports are closed by the upper piston again, the distance between the pistons don't change much anymore. 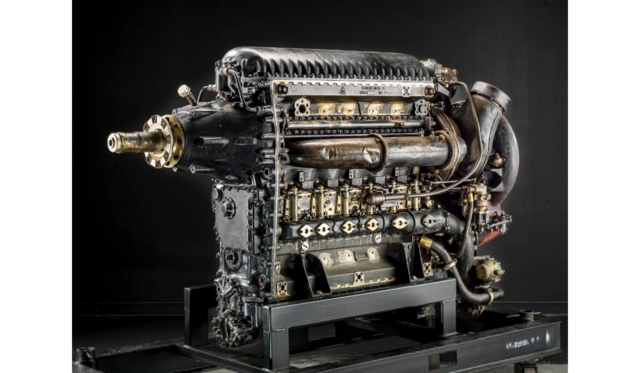 An opposed piston engine can only produce power while both pistons move away from each other. For a good expansion ratio, the angular difference between the cranks has to be relatively small. But this means there won't be any way to produce significant power. I tried to solve this by increasing the angular difference between the cranks, represented by the lowest graph. The space between the pistons change much more in this case, providing the possibility to create an opportunity to expand the steam. But now, the steam is wasted. When the port opens (represented by the blackened area in the highest graph), the lowest graph/lower piston just reaches its top. An approximately perfect condition. But the distance of the lower piston to the intake port is ridiculously big. One third of the stroke is filled with full pressure steam and then, the steam gets shoved to the bottom end of the cylinder without any significant change of the displacement space before the outlet ports open. I could have experimented around some more with other configurations, but these cases already showed the design's shortcomings. All in all, using pistons to control the intake port in an opposed piston steam engine is definitely doable, but not practical. So, my project needs to be developed further. It is a learning project and learn I will. To overcome the inlet timing issue, I decided to add inlet valves. Either Briggs & Stratton poppet valves or maybe rotational valves. Since there are no cylinder heads to host the valves, I think about a sort of inlet register at one side of the cylinders driven by a chain or some gears. This way, I don't have to worry about the governor, since now, the governor only has to overcome the friction & spring-load of the valve drive. Using inlet valves, the pistons can be made moving simultaneously, providing a smoother run. Last edited by Ramón on Wed Mar 06, 2019 12:51 pm, edited 4 times in total. Nice to know, that there is interest in my opposed piston steam engine project. Last edited by Ramón on Sat Jan 26, 2019 8:44 pm, edited 1 time in total. The problem with high speed engines is that they are high speed. An hour cooped up in a boat with one of them would satisfy anyone for a lifetime. Interesting technical problems to think about here but I don't recommend building a boat around one. Around a problem, I mean. There's a reason most launches have fairly slow turning if inefficient engines. They are pleasing to live with. I see that I used the word 'problem' three times in this post. I'm getting old and cranky. Before the crankshafts arrive, I have to decide what kind of steam distribution I am going to realize. Briggs & Stratton or self-turned poppet valves or a radial piston valve. Poppet valves have by nature little friction due to the non-sliding, but lifting opening. I know IC engine valves move very easily in their precision reamed valve stems and while the springs are very strong, they give off the spring load, that they swallow to be compressed. But to design and machine a proper cam is something I have respect of. On the other hand, a rotating tubular valve is very easy to machine. But the rotation would create constant sliding friction. 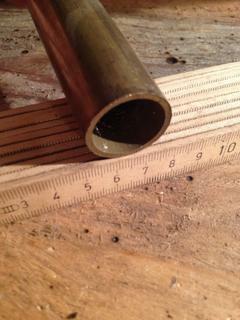 This is a brass tube I have lying around. It would have the perfect size. But I am not sure what material pairing I'd use for the rotational valve. I thought about buying a PTFE tube, that would fit inside, because I will not mix the steam with lubrication. That is what the crankcases will be for. Added: I just realized PTFE is said to be heat resistant to 370°C. Considering my lack of experience with the efficiency of superheaters, I prefer to have more safety distance towards the maximum temperatures the materials can handle. engines I'm not a big fan. Our power plants do not run at a constant speed and load. I was crew on a boat with a state of the art three cylinder inflow and we nearly took out a few docks by not being able to reverse direction predictably. The same goes for designing a cam. There is a reason that probably the most successful steam engine, the Corlis, used a simple eccentric to drive it's valve gear. Cams are hard to design and introduce impact shocks and vibration unless operated at very low speeds or designed by the Polydyne method which need a good understanding of the geometry and access to the right program. I've does it for I.C. 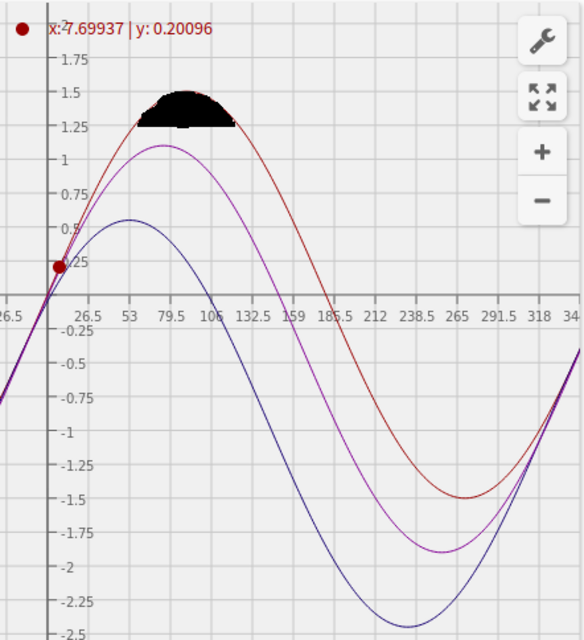 engines and it involves solving the first, second and third derivatives of a polynomial curve at hundreds of points in the rotation. Your original Briggs and Stratton most likely has such a cam design but has entirely the wrong profile for your use. Also, a small engine just radiates it's power away because it is so small. Mice are hungry all the time for that reason. You might just spend your whole boat budget on the engine. And given the poor flexibility of uniflow engines I'm not a big fan. Our power plants do not run at a constant speed and load. I was crew on a boat with a state of the art three cylinder inflow and we nearly took out a few docks by not being able to reverse direction predictably. I respectfully disagree about uniflow engines have poor flexibility and poor reversing generally - I think you may have had a bad experience. The big boats were powered by dual, Skinner Marine Unaflow, coal-fired steam engines, and were the last coal-burning, passenger-carrying boats built in America. The powerful Skinner engines responded very quickly when reversing direction, an extremely important capability since the boats docked without the aid of tugboats. I've been on the SS Badger, very manuverable. The captain walked from the bridge to a stern pilot room which had its own set of engine telegraphs. It was amazing seeing the captain and all the chiming of the telegraphs and this 400ft+ steamship finish up exactly perfect for docking! Definately worth the ride if you get the chance. Granted the car ferries where ships not so much boats. - But also Baker Uniflow Traction Engines are pretty flexible I've watched them in person at steam traction engine shows. The most flexible steam engine of all is probably a twin single cylinder w/ cranks 90 degrees out of phase and 75% cut-off or more - these were often used as hoist or elevator engines. However, that doesn't do much for steam economy. Triples and quad expansion engines were basically designed to run at a single pressure and load; yes, you could throttle them, but they really wanted to run at a fixed speed for best efficiency, and the various expansions were designed w/ those settings in mind. Single cylinder uniflow engines tend to have more speed variation per revolution than more conventional engines because of the large swings in cylinder pressure. The short cut-off meant that reversing could be tricky as well. Both issues were dealt with by using multiple cylinders, to good effect as noted in various places. Corliss engines used eccentrics to open the valves, but the valve gear would disengage and 'drop' closed, relying on a oil-filled dashpot to control the closing speed. This made short cut-offs practical, but meant that these were essentially fixed speed engines. These engines were very popular in the US in stationary applications, but in Europe uniflow engines w/ Lentz poppet valve gear were very common, with compound uniflow engines (conventional HP cylinder, unflow LP) being used as well. I'm busy building a large uniflow (5.75" x 5.75") in my garage, but progress has been slow as we're spending much of our free time making decisions about our retirement house, being built ~1000 miles to the Northwest. Some details in the Sea Lion threads.